If you want to take advantage of inbound leads, you must create content for your website that attracts people. It must draw people who are researching and trying to find solutions. We must also avoid common mistakes we make trying to get inbound leads. 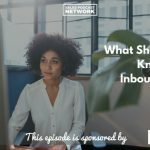 On today’s episode of The Sales Evangelist, Ken Tucker continues our month-long conversation about inbound strategies and how we can generate leads and build value for our customers. 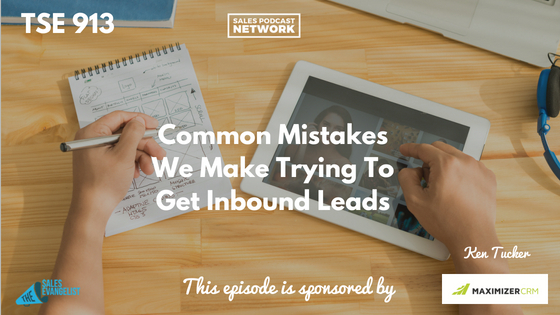 He helps us identify the common mistakes we make trying to get inbound leads. Ken got his start in IT, so he calls himself a big systems guy. He said he sees a lot of small businesses struggle to put together a marketing system that’s repeatable and optimizable. It’s important to think about search engine optimization, or how findable your website is when people search for you. SEO optimization is a traffic source and lead generator. Unfortunately, a lot of businesses don’t have a clear, strong call-to-action. The message at the top of their page isn’t clear when you get there. It isn’t super obvious what you do, and it needs to be super obvious. It needs to be super obvious what problems you solve for your customer. If you write your website from your business’ perspective and talk about your services and your certifications, that’s the wrong approach. Ken calls himself a StoryBrand guy, which means he focuses on putting the customer first. The customer is the hero who has a problem and he’s looking for a guide with a plan who can help him achieve an outcome or avoid failure. On your homepage or any key landing pages, clarity of messages is critical. They must understand within 3-5 seconds of landing on your website what it is you do. You also have to think about your website’s encryption, as well as how your website performs on a mobile device. Given that 50 percent of all searches happen on a mobile device, your website has to perform well on mobile platforms. StoryBrand prompts businesses to think about problems in three dimensions: external, internal, and philosophical. A customer seeking a dentist, for example, has an external problem of a toothache. His internal problem is that he is terrified of dentists because it hurts way too much. The philosophical problem is that it’s 2018, and it shouldn’t be that hard to have a stress-free experience at the dentist. The dentist will want to keep these problems in mind while he’s creating his marketing materials. People are looking for a solution to help them achieve an outcome. Think about their before state and their after state. The reason they buy from you is because of the internal problem that they have, and the fact that you have spoken to that internal problem. Identify that internal problem by interviewing your existing customers. Ask them why they selected you. Why did they feel comfortable working with your business? Do keyword research and figure out the phrases people are typing in when they are doing searches. Make your content match with the phrases that people are using when they search. You can determine a lot of the internal, external, and philosophical problems by getting feedback from the people you currently work with as well as those who are out there on the Internet. I hear from people all the time who tell me that they listened to the show for a year or more before they jumped into my coaching or the TSE Hustler’s League. Because I shared resources at one point, they come back over and over again. It’s a long-term game, but too many entrepreneurs view it as instant gratification. You have to think about your website from the customer’s experience. What is the customer’s journey? Do you understand the buying cycle? What information will they need to know along the way? When will they need the information? Where should the content be delivered? You must map that out and do some strategy work. Ken is a Duct Tape Marketing guy as well, so he defines the customer journey as a marketing hourglass. You’ve got traditional stuff that everyone talks about, such as know, like and trust, but in the world of online where the customer is in control, you really have to think about some kind of a trial offer before they are going to be willing to buy. Think about giving the customer an opportunity to find out what it’s like working with you in a much lower risk scenario. When you flip the hourglass over, you’ve got repeat and refer. How do you do more with existing customers? Marketing shouldn’t stop once someone becomes a customer. Your website shouldn’t be simply an online brochure. You need to actually move them through the process and make it easier for them to decide that you’re the right company, product, or solution for them. You must have marketing automation and CRM for your business. There are many great ones depending on the complexity of your business. If you’re going to work hard to get leads to your website, make sure that you’re showing up when people are doing certain critical searches. Facebook advertising is powerful and cost-effective, and direct mail campaign can be incredibly powerful as well. You’re going to build the initial relationship online and then nurture it through email sequences that will move people through the decision-making process or the buying process. When someone comes to your website and watches a webinar or downloads a checklist, what is your followup? Figure out where your customer is spending time online. If you’re a b2b, Facebook may not be the best place for you to start your advertising strategy. Identify what sources of traffic you want to generate. Will it be SEO? Paid strategy? Keep in mind your customer’s journey: know, like, trust, try, buy, repeat, and refer. Don’t buy into the idea that you have to have the perfect website to get started. It’s an iterative process. Focus on a couple of key pages. If you build only one page the best way you can, don’t get wrapped around the axle trying to make it perfect. Develop strategies that align with where your customers are already spending time online. The last thing you want to do is fumble away an opportunity. Think about the customer journey and focus on the problem that you solve. Once you’ve started the customer through that journey, it will help you write effective sales copy and define the before- and after-state. You can find Ken at changescapeweb.com, and on most social media channels as @changescape. Grab a copy of Ken’s book Social Media Marketing for Restaurants, which is valuable for restaurants and also for any business that has a brick and mortar type of business where they have lots of traffic coming in. Ken also wrote a book called Reputation Marketing (Marketing Guides for Small Businesses). 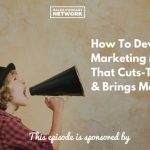 Check out the Video Jungle podcast, your source for marketing and selling your brand using video. Plan, create and share your way to better content and strategy. Video Jungle offers top-notch, state-of-the-art advice about video which is a great way to offer relevant content on LinkedIn.